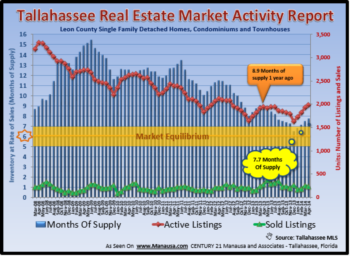 The inventory of homes for sale in Tallahassee remains far too low, with fewer than 1,200 listings currently marketed in the Tallahassee Board of Realtors Multiple Listing Service (MLS). This article is going to show you those listings and then follow with an analysis of building permits and their impact on our inventory-starved housing market. Every single family listing in the Tallahassee MLS (includes condominiums, townhouses, and single family detached homes) is shown below. If you are hearing talk and find yourself concerned about the next housing bubble, then you should check out this week's one-page special report on the next housing bubble, you can find it by clicking here. The graph below was used in that report, and it will be used today because it helps answer a major question about the future of our housing inventory in Tallahassee. The graph shows all residential permitting activity in Tallahassee for the past forty-eight years. The graph above includes new residential permits for single-family detached homes, single family attached homes (condominiums and townhomes), and multifamily properties. I've omitted mobile home permits from this though I do keep an eye on them every month, and they have not changed enough to be significant in our findings. As Tallahassee grows, we must build new residential properties to house our new residents. 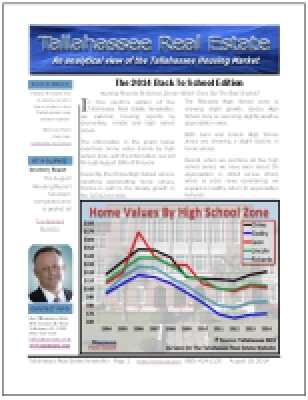 Currently, there is a significant shortage of homes for sale in Tallahassee (see this report for specific areas and price ranges), and we are not building new residential properties fast enough to fill the shortage. The table in the graph above shows that residential building permits are down 47% this decade compared to last decade, and it's time we start building (wisely, not wildly) to balance out the inventory of homes for sale. We are going to continue to see a relative rise in multi-family construction as single-family homes become less affordable due to rising construction costs and rising mortgage interest rates. Nevertheless, there is plenty of opportunities for builders to deliver condominiums and townhouses to fill-out the middle of the market where inventory is the most competitive. We just need to start building. While demand appeared to have softened when mortgage interest rates spiked this past Summer, and I currently see no evidence that demand will fall far enough to make our relative supply of homes for sale sufficient. The following graph shows just the single-family building permits, which shows 30 years of declines. The current decade reveals single-family building permits are averaging 62% fewer each year than what was reported last decade. The rate of population growth is an important metric to consider when looking at building permits. After all, if we're not growing, then we probably don't need many new homes. Every source that I have examined estimates Tallahassee's growth is slowing down, so it makes sense that we're seeing fewer building permits. But if you look at the supply and demand of homes for sale in Tallahassee, then you know that we've slowed permits too much. Our local lenders need to help encourage builders to add to the inventory in the areas and price ranges that are currently too thin. We have consumed the glut of homes below $350K and we can handle more homes below $450K in certain areas. The following table shows the relative supply of homes for sale today. Builders should seek to build in the areas and price ranges shown in green, and they should avoid building in those areas and price ranges identified in yellow. 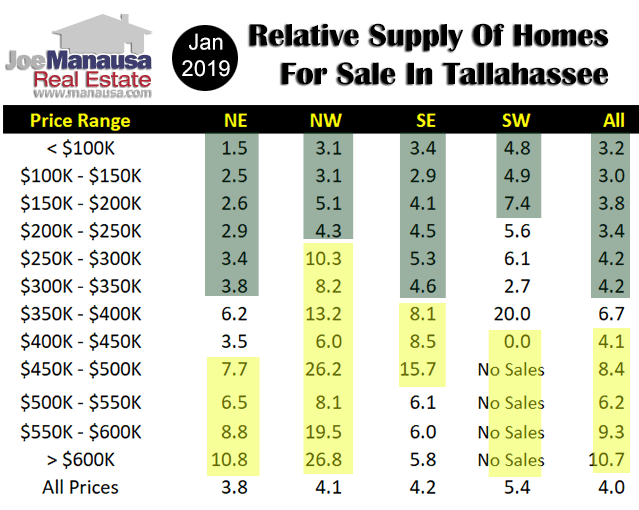 If you are planning on selling a home and/or buying a home in Tallahassee this year, look at the table above to get a feeling for how it will go. Green means buyers will compete for too few houses, yellow means sellers will compete for too few buyers, and the white areas are where buyers and sellers should be on equal footing. 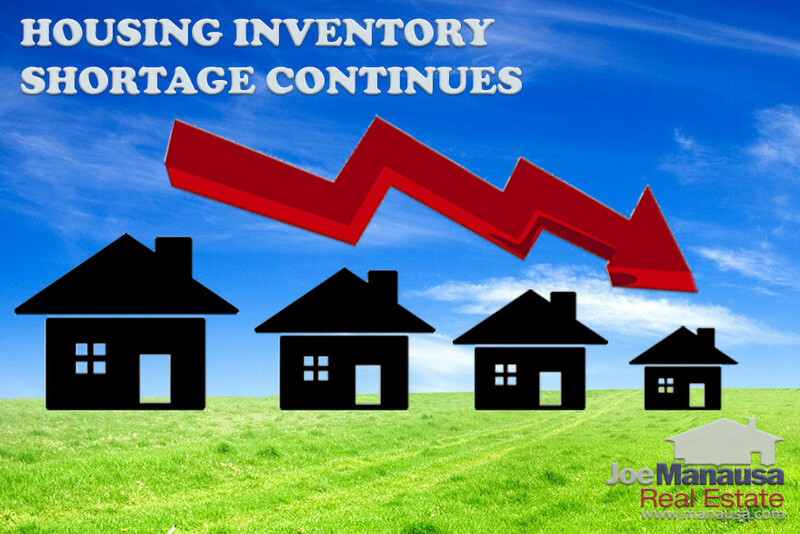 If you want to know more about how the current housing inventory might impact your move, give us a call at (850) 366-8917 or drop us a note and we'll set a time to review your personal situation and show you what to expect this year.